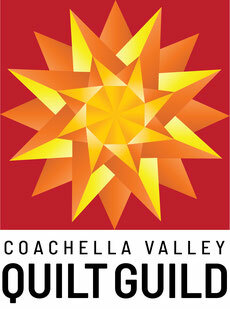 Centrally located in the beautiful Coachella Valley of Southern California. 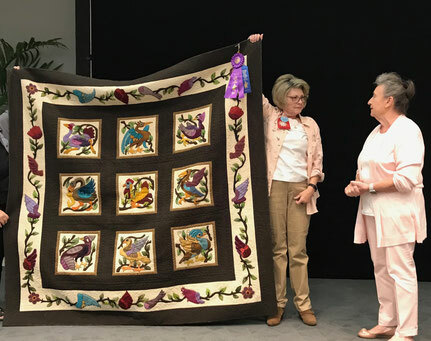 The Guild shall be a non profit organization established to promote appreciation of quilting, to share and to uphold the heritage of a timeless folk art, and to further the education and skill levels of the members of the guild. For more information about our Opportunity Quilt please click here. Like us on Facebook. Check out the guild's Facebook page and know what is happening. Click here. Learn how to add more pizzazz to your quilts with artist & quilter Kathy Dunham. Technique alone does not make an outstanding quilt. Proper color choices can make or break a good design. Kathy is a certified color instructor and has taught at such institutions as The Getty Museum and Palm Springs Art Museum. By combining art and quilting she creates exciting visual pieces of work. Color can set the mood, attract attention or make a statement. Find out which combinations work best and how to apply contrast to make your creations stand out. Stitches For Kids Are Doing It Again! 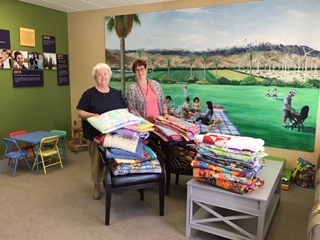 Patricia Page and Stitches For Kids delivered 27 quilts to Olive Crest and 26 quilts to Rescue Mission. They are doing amazing work. Thank you for all that you do for our local community! Guild member Roberta Peterson won best of show at the Riverside County Date Festival in February of this year. Congratulations, Roberta! Each year the guild encourages members to enter quilts, quilted items or other handcrafts in our local county fair. The display of handicrafts is wonderful to see. We also display our yearly Opportunity Quilt and talk to members of the public about quilting as we sell tickets to win the quilt. A number of our past winners have purchased their tickets at the Date Festival. 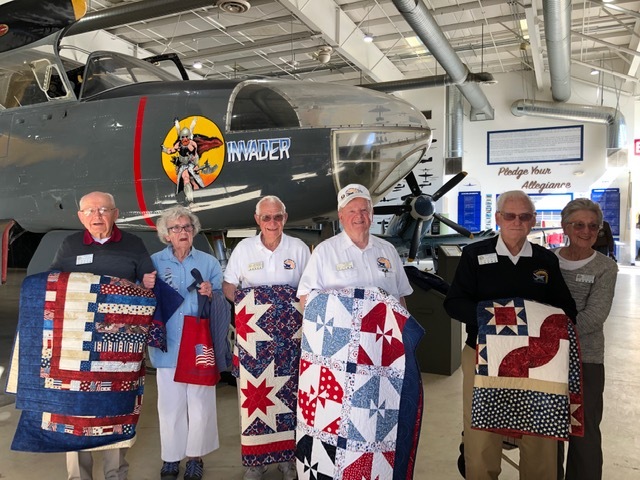 In February, the guild’s friendship group Sun City Palm Desert Quilters present four Quilts of Valor at the Palm Springs Air Museum. This presentation was part of their goal to give quilts to local organizations and to military related services. 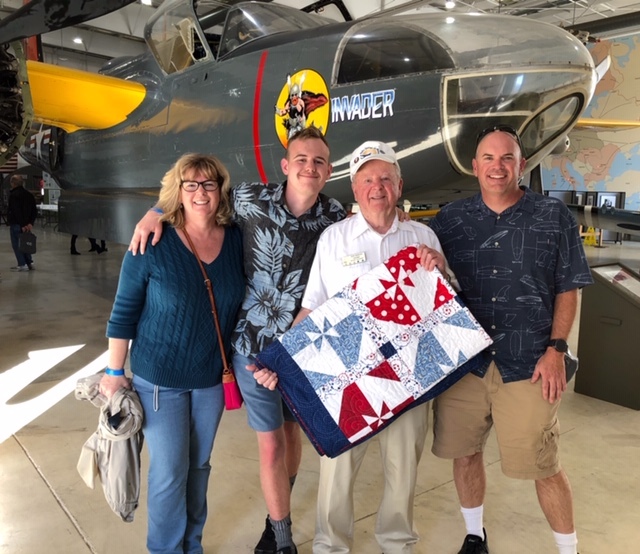 The first Quilt of Valor was presented to Charles Pettit who served as an anti-aircraft gunner with the US Army 514th Battalion in Hawaii and Okinawa from 1943 to 1946. Peter D. Behenna received the second Quilt of Valor for his service from 1943 to 1946 with the US Navy Seabees as a coxswain. He worked with the 142nd Naval Construction Battalion, the 5th Marine Division, 32nd Special Naval Construction and motor transport. 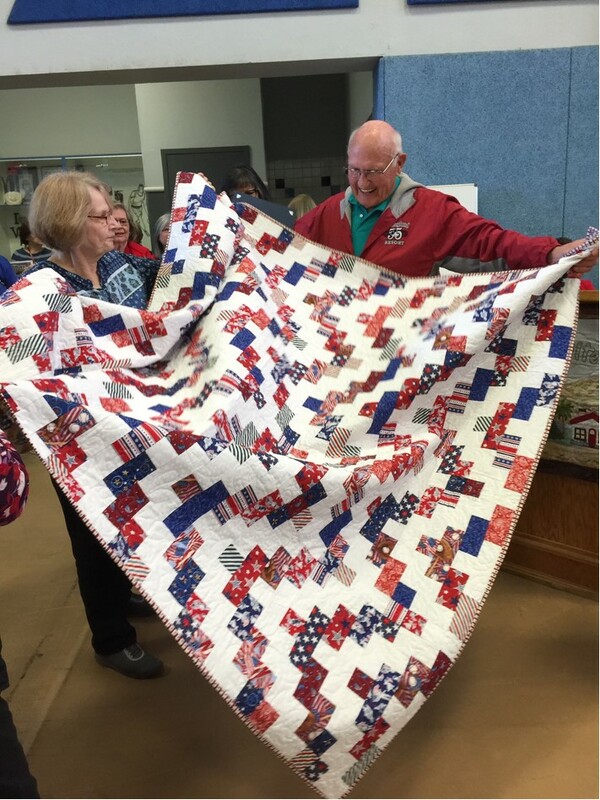 The third Quilt of Valor went to Robert D. Chapman who served in the US Navy as a signalman from 1943 to 1946. He was stationed on PT boats in the Pacific and as a signal tower operator in the Solomon Islands. Lt. Col. Blaine L. Mack, USAF Retired, was a P-38 pilot with the 11th Fighter Squadron in the US Army Air Forces during WWII. He also served in Korea as a F-86 fighter pilot and during the Cold War as a B-47 and B-52 pilot. 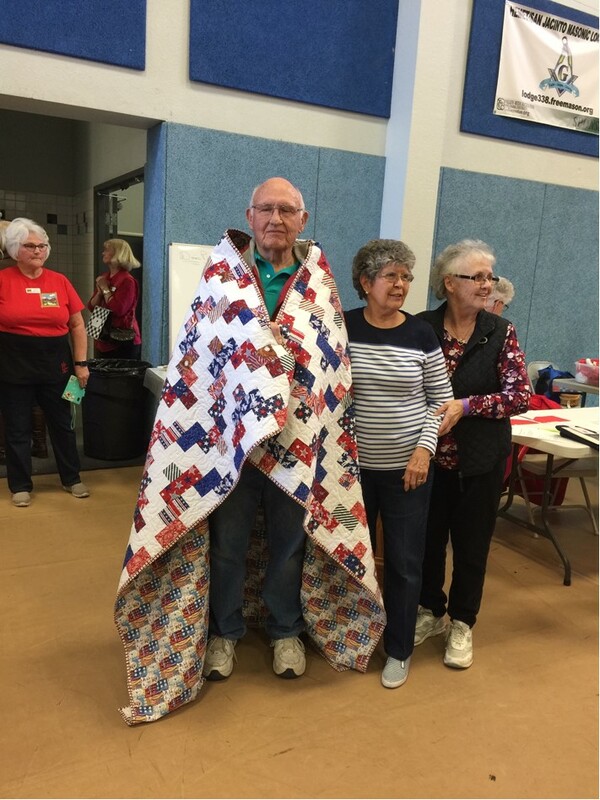 Lt. Col. Mack received the fourth Quilt of Valor at the presentation. All four of these gentlemen are volunteers at the Palm Springs Air Museum. Thank you all for your service to our country and for giving your time at the Air Museum so others will know the history you have seen. 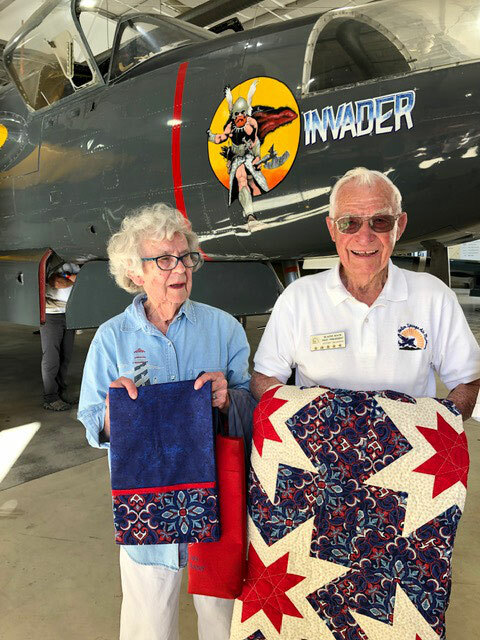 Stella and Linda represented our friendship group Stitches for Kids when the Quilt of Valor the group had made was presented to veteran Gordon Best at the Hemet Quilt Show in February 2019. Gordon Best was in the US Army during Korea. He said they were the coldest winters he ever spent while serving there. His wife brought him and he was totally surprised with the award. 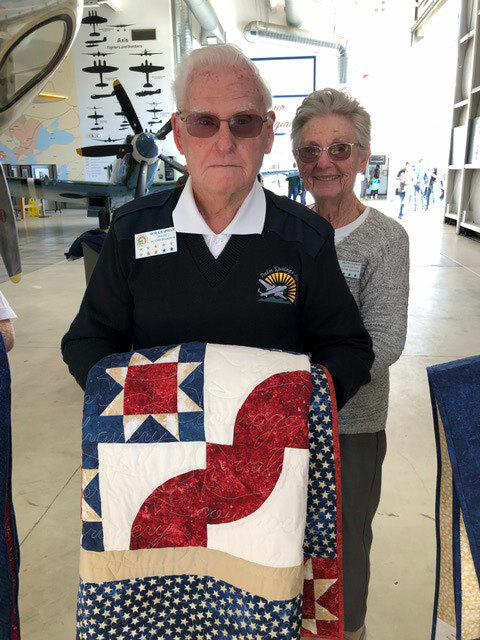 His wife told Rose Rhoads, Quilts of Valor organizer, Saturday that when she got home from the show (she was a member of the Hemet guild and was helping) that Gordon had the quilt spread out on his bed admiring it. She could have made him a QOV herself, but it always seems that when the quilt comes from the QOV organization, it seems more significant. 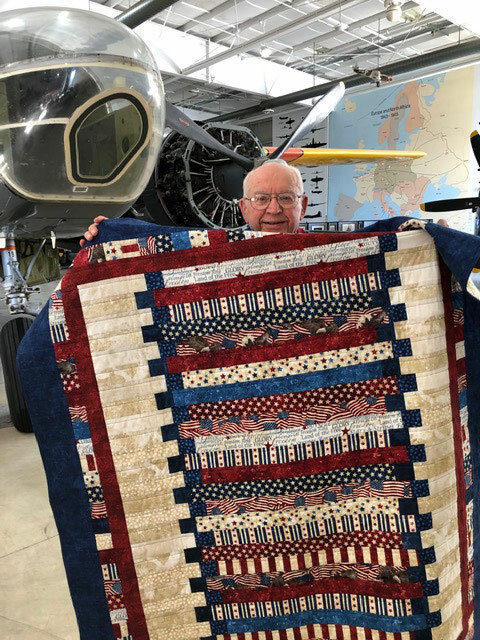 Congratulations to Stitches for Kids for a beautiful quilt and thank you to Gordon for his service during the Korean War. March 2019 Meeting with Joe Cunningham! Check out the photos from Joe's lecture and class. Click here. March Show and Share -- Click here. 2018 Show and Share click here. See what our guild members have been creating!! Have quilt related items you would like to donate?? Please contact Camie Copelan. Your donations will help support our guild's mission to promote and share the art of quilting.